Will we have to transcode GoPro Hero7 4K MP4 into another codec to be able to work in FCP X/7/6? GoPro HEVC h.265 MP4 file type is a compressed output format and not an ideal editing format. What’s more, it also would be a bit hard to handle 4K video with Final Cut Pro 7. To edit Hero7 footage in FCP X/7/6 smoothly, a suggestion is to use UFUWare Video Converter for Mac to transcode GoPro Hero7 MP4 to ProRes, which is a friendly format supported by FCP. With the best GoPro video converter for Mac, you can effortlessly encode/re-encode HEVC h.265 from GoPro Hero7 for smoothly importing and editing in various non-linear editing systems (NLE), including Final Cut Pro X, FCP 6/7, iMovie, Final Cut Express, Adobe Premiere Pro, Avid Media Composer, etc. STEP 1: Launch UFUWare GoPro 4K HEVC h.265 to FCP Converter and then click the adding button to import your GoPro Hero7 4K mp4 files. STEP 2: Click the Format box to select the output format from Apple ProRes 422 (HQ), ProRes 422, ProRes 422 (LT), ProRes (Proxy). It depends on what you attach importance to. 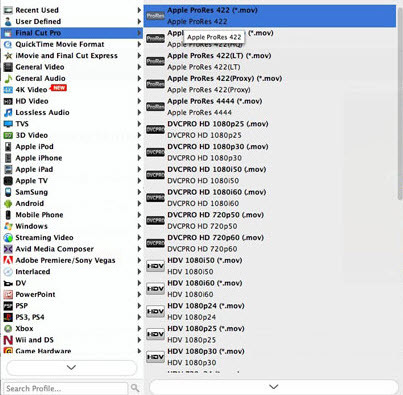 Here we recommend the Apple PreRes 422(HQ) if you give the priority to the quality of the converted videos. STEP 3: Before you convert files from GoPro Hero 7 to FCP X, you can click “Settings” button on the main interface, and then you can change the resolution, bitrate, frame rate, etc. it is very easy to adjust these parameters. 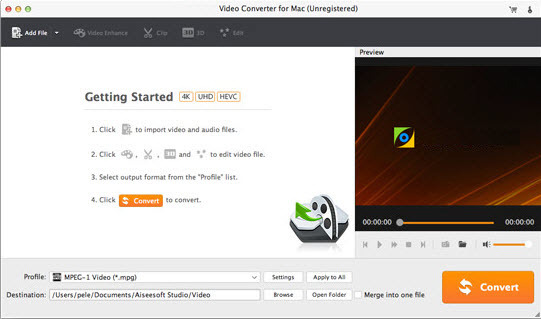 STEP 4: Click convert button to start converting videos from GoPro Hero 7 to FCP X/7/6, UFUWare Video Converter for Mac will begin the conversion immediately. When the HEVC h.265 to ProRes conversion is 100% completed, you can get the resulted MP4 video via hitting on Open button. Moment later, you can upload GoPro Hero7 4K MP4 files to FCP X/7/6 with easy editing.